Our Vision for 2017-18 "Creating Life time value for students"
KOCHI: Kochi Metro Rail Limited (KMRL) in association with South Indian Bank (SIB) on Wednesday installed plastic recycling machines at three metro stations as part of the metro agency’s initiative to go green. SIB is sponsoring the first three machines as part of its corporate social responsibility (CSR) initiative. KMRL will provide space for installing the machines at the stations in unpaid areas, so that even the general public can use them. Wild West Media, the manufacturers of the machine, will be responsible for its operation and maintenance. The highlight of the machine is that customers using the facility will be incentivised through issue of discount coupons at select commercial outlets. Food outlets and supermarkets will be linked with the machine manufacturer for provision of coupons. At present, three corporates are associated with the initiative. The machines have been designed to dispose of and recover products effectively to be used for cost-effective means for recycling. The scraped plastic will be sold to recycling vendors who will process scrap to produce plastic granules, and the end product will be used for textile manufacturing and road resurfacing. 18 NCC Cadets of SKASC received ranks in the NCC camp held during the month of June. Freshers' day- SKASCians welcome the 2017-20 batch students. SKASC Students take Anti-Ragging pledge. 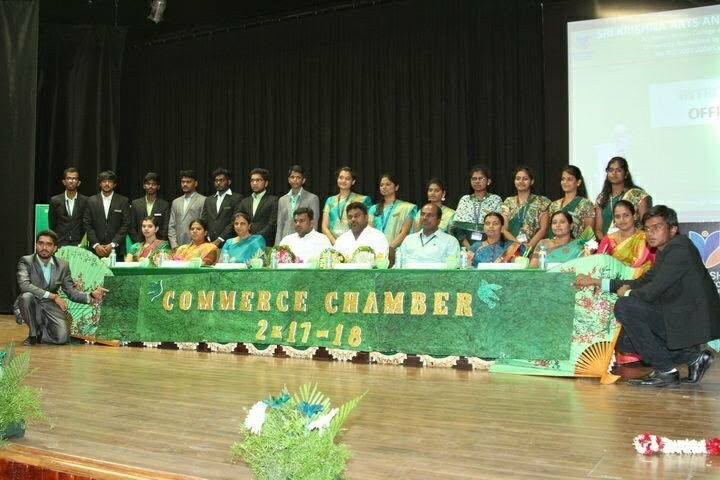 Valedictory programme of Commerce Department is organised. The team from Grant Thronton and NSE give motivational speech about the Industrial needs. SKASC - Catering Science Students won First Prize in the events organised by the Jennys Academy, Thiruchirapalli. SKASC - Computer Science Stream students presented paper and attended workshop in Christ University, Bangalore. Commerce Department students organised Financial literacy campaign at Ooty. SKASC Cricket team won the inter-collegiate T20 Cricket match. Twenty students from Commerce Department participated in the Literal Events of Pondicherry University. Volley Ball team won the Sate-level Trophy organised by Gandhigram University in Dindugal. SKASC - B.Sc IT students won the Gateway 2017 trophy ( An inter-collegiate IT events) organised by PSG college of Arts and science. SKASC - B.Com (PA) Students won the Second Prize in the Management Games conducted by Fire Bird Institute. SKASC badminton team won the Inter-district Badminton trophy of Tamilnadu. SKASC Students and faculty visited Amity University in Noida and exchanged their views. Social Work students celebrated the Pongal in a tribal village near Nagalur. They spread the news of basic education among them. Computer Science - Head of the Department Prof. Vijaya participated in the Technnext India Programme organised by Symbiosis in Mumbai IIT. Commerce department faculty visited Manali and celebrated the day with ethnic wear. BBA students participated in Vibrant Gujarat Programme in Gandhinagar. Congrats: 139 students are placed in Infosys Technical Drive. National conference on Viral Marketing of Financial Services concluded. SKSAC Alumni - Sowbarnika ( 2016 Passed out B.Com CA) received Young Achiever Award from Oracle India Private Ltd., Bangalore. SKASC Alumni - P V Amith (2013 batch Catering Science Student) won the "Emirates Culinary Guild" Award for Australian Menu in Dubai. Costume Design Students stitched dresses for new-born babies and distributed in Government Medical College Hospital, Coimbatore. Computer Science Streams students participated in the Annual Conference @ IIT Chennai. In the Bharathiar University Athletics meet, SKASC students won two Gold medals, four Silver medals and nine Bronze medals. 518 students are selected in IDBI Federal Insurance Company's placement drive. The total placement offers received by the SKASC students crossed 1000. 90 students are placed in Capgemni IT Solutions Ltd. Debate on "Young Minds' perception on education" is organised by Tamil Department. Department of Commerce student presented the research paper titled "Gear-man Role in CSR Activities - A study conducted in Coimbatore Industrial Park" in AIMS conference held at MICA, Ahmedabad. Ramanujam Day is celebrated by Mathematics department. They organised number theory games. 219 students are placed in Infosys (Non-technical) . AIDS Awareness programme is organised by the NSS students on the eve of World AIDS day. Fifty Nine Computer science stream students are selected in CTS infrastructure Ltd.
Students of Costume Design and Fashion participated in various event organised by TIPS Global Institute, and won the First Runner Up Award. 13th Graduation Day of SKASC is organised. Dr.Murugappan from Thiagaraja College, Madurai visited SKASC to apprehend the Learning architecture. SKASC - NCC students participated in NCC camp in Madukari and won the prizes. Catering Science Students are placed in Oberoi. Their offer letters have been issued. Sangeetha K of B.Com (PA) won the First Prize in State level Athletics in High Jump. Shaly of B.Sc (CS) won the thrid prize in Discuss throw. Gnanasundhar of M.Com (IB) won the second prize in High Jump. SKASC - NSS unit organised Blood Donation camp. Oberai Group of Hotels conducted Placement Drive for Catering Science Students. Eleven students are placed. Entrepreneurship Programme is organised by Commerce Department. Students submitted their "Seed" ideas. TCS organised "Students - Parents" interface programme. Department of Costume Design organised Edutainment for their students in "Design and Delivery" Concept. Department of Bio-Science organized a seminar on Transcriptomics - for Crop Improvements’. Dr. R. Manimekalai. Scientist, from Sugarcane Breeding Research Institute, Coimbatore addressed the gathering. PG students of SKASC visited Delhi University and interacted with the faculty members there. Computer Science Stream students organised Inter-collegiate meet. The talents from 131 colleges are exposed. Eye Camp has been organised by NSS Volunteers which benefited 212 students. Teachers Day is celebrated with the motto of building the future India. SKASC BBA students participated in the "Meet and Greet" Programme in Clayton State University. This is the part of the interface programme. SKASC - Volley ball team are the Runners in Tamilnadu State level Tournament organised by SVN College, Madurai. Prof . T. Veeramanikandaswamy of Electronics department has been conferred Ph.D in the Viva-voce examination. Academic- Interface Programme - Commerce Department students and faculty members visited Mysore University and exchanged their views on CBCS. Commerce Department Students - Outbound Programme to Tipu sulthan's Fort @ Srirengapatnam. SKASC - B.Sc Computer Science Students organised "Green Outbound Programme" to Mysore. They created the concept of ethical tourists by avoiding plastics and using eco-friendly products. Students of Sri Krishna Arts and Science College participated in the Leadership camp organised by ICTACT, Tamilnadu at CODISSIA Halls in Coimbatore. Department of Commerce students organised debate on Social Media. B.Sc Mathematics Students showcased their Mathematical Models. They portrayed the models created in Applied Mathematics. B.Sc Bio Technology students visited Indian Institute of Horticulture in Bangalore. Computer Science Stream Association organised Students interaction programme on Cyber Crime Threats. Dr.Raajan, Inspector of Police, Coimbatore delivered special lecture. SKASC Volley Ball Team are the Runners up in the State level Youth Volleyball Tournament. SKASC - Badminton Team Secured Third Place in Vaishnav College Trophy, Chennai.